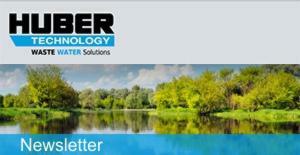 Our newsletter - your opinion! We would like to hear your opinion about the HUBER Newsletter and appreciate your participation in our short survey (only 3 questions to be completed within 2 minutes). As a thank-you for your time you have the chance to win one of three useful Leatherman MultiTools in our prize draw, or optionally donate to a water charity project! HUBER fine screens for the protection of downstream membrane systems have a long tradition in the USA. Due to continued further development we are able to offer tailored solutions for membrane screening and implement machines for a variety of different applications. On the largest sewage treatment plant in Upper Austria with a design size of 950,000 PE, the coarse screens were replaced and the screenings treatment system was refurbished. Furthermore, a screenings removal and transport station was built. The installation of the HUBER Complete Plant ROTAMAT® Ro5 units is an important moment in the execution of the project. Such plants are normally lifted and moved into the building with a 50t crane. Heavy-duty rollers are used to finally place the plants in their position. The photo series in the below article shows impressive pictures. Whether we develop new products or redesign existing machines, we always do this considering also the safety aspects that are important to minimise the hazard potentials when handling our products as required by the Machinery Directive. This has been the case with our sludge turner for solar sewage sludge drying as well. A current research project on the reduction of trace substances and micropollutants examines the effects of upstream ozonisation on the HUBER Active Carbon Filter CONTIFLOW® GAC. The duration of the project is 18 months. As research results we expect to see an increased elimination efficiency and a longer life of the active carbon. Stay on the safe side! HUBER security doors certified to resistance class RC3 and RC4 as well as burglar-resistant HUBER manhole covers certified to resistance class RC3 increase the safety of drinking water supply structures.